Alice is an avid golfer, who, in her eagerness to play the game, has persuaded her husband, Joey, to join her so they could play together. Joey, not known for his athletic achievements, complied but never has acquired the skill level of his wife. Despite this, and some physical limitations, he diligently pursues the game anyway. The golf course the couple play is heavily wooded on both sides of most fairways. On the occasion that Joey does hit the ball, it ends up going in a slow arching curve to the right, a shot golfers disgustingly call a slice. Because Joey never took a lesson along with the slicing tendency of his shots, he spends a great deal of time in the woods. “What! Your husband can’t play golf?” Margo asked. “No. That’s not the problem.” Alice corrected “It’s that Joey can’t find his lost golf balls.” Alice continued. “Why is that such a problem?” Asked Margo. 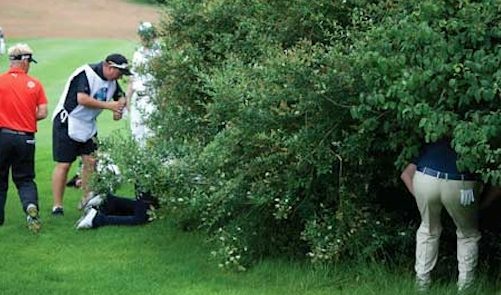 “The problem is in the way he goes about looking for his lost ball.” She responded. “We all lose golf balls but we can usually find them because we look in the area of where the ball is lost. Joey looks only in places where it is easy to look and not where the ball landed. “That makes sense.” Margo said. It seems that once inside the woods, Joey has no way of knowing the line of entry the ball took in getting there so he isn’t quite sure where to look. If the path the ball took is in the more difficult and heavily wooded area, it blocks his vision and limits his search. So, he is drawn to looking in places where he can more easily see things. And unless his ball landed in that area he isn’t successful in finding it. “When we play with other couples or when the group playing behind us keeps yelling to us that the ball ‘went in here’ and he is standing in a clearing some 40 yards away, it’s embarrassing” she lamented. “It’s too woody and I can’t get in that way is Joey’s usual response.” Alice concluded. Alice went on to explain that Joey usually buys old golf balls so their loss doesn’t affect him. She said her hope was to get Joey to look for his golf ball in the right place instead of the easy-place-to-look which would improve his chances of finding his golf ball, speeding-up the game and eliminating the embarrassment. “So, what did you do”? Margo asked. “Yes, luck.” Alice went on to explain. It seems that Alice and Joey signed up to play in a couple’s golf league. As luck would have it they drew the names of Gordo, an old friend of Joey’s from high school, and his wife as their partners to play in the same foursome all summer. The relationship between Joey and Gordo revolved around competitiveness; each trying to outdo the other. If Gordo should win a challenge between them he would let everyone know about his success in and effort to put Joey down. Joey knew that if Gordo saw him hit a ball into the woods and not look for it where it went in, Gordo would look in that spot. If Gordo found a ball he would then announce the name of the golf ball to all, later in the club house. Because Joey hit so many balls into the woods, he wouldn’t remember if the ball Gordo found was his or not. The club members knew of Joey’s liking for the woods and would certainly assume the lost ball was Joey’s. “How has it worked out?” asked Margo. “It was tough for a while, but Joey started looking for the ball at the spot it entered the woods. But, because of the many scratches on his face and arms he got from the underbrush in looking there, Joey decided on taking lessons and since then his walks in the forest have diminished considerably” Alice smilingly ended. • You cannot solve personal, emotional or behavioral problems by addressing the personality characteristics or traits of the individual traits of the individuals involved in the problem. Most of us, when trying to solve people-problems, look to the traits or personality characteristics of the individual or individuals involved as the focus of our corrective efforts. In Joey’s case it is his trait of stubbornness. We often believe that if we can correct these traits or personality characteristics the problem is solved. One problem with this approach is that no one quite knows how to change personality character traits. Secondly, even if Alice were successful in changing Joey’s trait of stubbornness there is no assurance that Joey would stop looking in the easy spots, simply because it is more rewarding to do so. However, if Joey were to change his search pattern, his behavior, as he did, there would no longer be a problem. It’s the behavior, that is the problem and if you want to solve personal, emotional or behavioral problems you must first address the behavior involved. When correcting people problems, you should remember: It is the behavior that is the problem. Without behavior there is no problem, so eliminate the behavior. • When correcting personal, emotional or behavioral problems look to the relationship as the arena or medium in which the behavior is to be changed. Joey’s behavior changed because of his relationship with Gordo. It was the competitiveness of their friendship that caused Joey to change the way he looked for lost golf balls and even caused him to prevent losing them by taking golf lessons. These two issues of behavior and how it operates as the source of personal, emotional or behavioral within relationships will be more fully examined in future articles.